The text of and illustrations in this document are licensed by the Michigan Section of the American Radio Relay League under a Creative Commons Attribution--Share Alike 3.0 Unported license ("CC-BY-SA"). An explanation of CC-BY-SA is available at http://creativecommons.org/licenses/by-sa/3.0/. The original authors of this document designate the Michigan Section of the American Radio Relay League as the "Attribution Party" for purposes of CC-BY-SA. In accordance with CC-BY-SA, if you distribute this document or an adaptation of it, you must provide the URL for the original version. The Michigan Section, as the licensor of this document, waives the right to enforce, and agrees not to assert, Section 4d of CC-BY-SA to the fullest extent permitted by applicable law. The ARRL Diamond and logo, the ARES logo and the ARPSC logo are registered trademarks of the American Radio Relay League in the United States and other countries. Working with state and local governments, as well as a wide variety of non-governmental agencies, Michigan amateurs participate in a wide range of public service and emergency preparedness activities. This report outlines the efforts of the 2012 calendar year. The Michigan Amateur Radio Public Service Corps (ARPSC) is an organization of over 2,000 amateur radio operators who participate in public service and emergency response activities. These include such things as providing communications for various walks and runs, as well as reporting storm damage, participating in search and rescue efforts, and providing backup communications for public safety officers. There are two primary programs, the Amateur Radio Emergency Services (ARES) and the National Traffic System (NTS). ARES provides "feet on the ground" for various events and incidents, while NTS provides a communications infrastructure that moves formal messages across the state and across the nation. There are two other programs, associated with ARES, which do not report independently. These are RACES and SKYWARN. RACES consists of those ARES members who have been approved by their local government to operate in critical areas such as incident scenes or Emergency Operations Centers. This approval generally requires a degree of training and a background check. The Michigan Section and the Michigan State Police have published suggested RACES qualifications, but the responsibility for vetting RACES members rests with the local Emergency Management Coordinator. Most counties follow the guidelines closely. SKYWARN members provide ground weather observations to their local jurisdictions and to the National Weather Service. SKYWARN members do not have to be ARES members, but almost always are, and most counties run SKYWARN programs as part of their ARES programs. SKYWARN observers are trained by the National Weather Service. Together, Michigan amateurs reported over 118,544 volunteer hours during 2012 representing a contribution of over $2.5 million . This is up substantially over 2011 (88,368 hours). ARES represents the largest program. ARES has a program in each Michigan county, managed by an Emergency Coordinator who works closely with the Emergency Management Director of the county to provide backup communications to the local jurisdiction. Because Michigan counties are so varied, the ARES organizations within those counties are quite varied. Although their primary customer is typically the county Emergency Management organization, they may also work with the local Red Cross, Salvation Army, and other NGOs. In some counties, the liaison with the fire departments or Sheriff's office is especially close. Each county has different needs, and the ARES organization attempts to meet those needs. In Michigan, and especially southern Michigan, severe weather is common, and in many cases, the greatest effort is expended with weather related activities. Amateurs spot bad weather and report to their National Weather Service office when bad weather is approaching, and following severe weather, are often involved in recovery operations. Michigan ARES programs reported 85,589 hours in 2012, over 20,000 of them occuring in May and June. Individual county reports are available at http://ares-mi.org/arpsc_ecrept.php. Links on the page allow viewing of individual county detail as well as previous reporting periods. The Michigan State Police divides the state into 7 Districts, and appoints a District Coordinator for each. ARES has a District Emergency Coordinator for each of those districts, who works with the District coordinator. In addition, the Section appoints a District Emergency Coordinator for each of the National Weather Service offices in the state. This NWS DEC works with the office's Warning Coordination Meteorologist to provide training to SKYWARN members and implement circuits that permit field observations to be transmitted to the NWS office effectively. Each DEC coordinates a staff of Emergency Coordinators, one per county, who work with local emergency management to provide needed capabilities to the county. Michigan's National Traffic System consists of amateurs who send messages (called "traffic") around the Section and around the nation. These amateurs are organized into a group of on the air nets that meet frequently with the intent of passing messages. These are the "unsung heros" of ARPSC; many practice their skills every day, but they operate behind the scenes, out of the eye of the served agencies and the public. 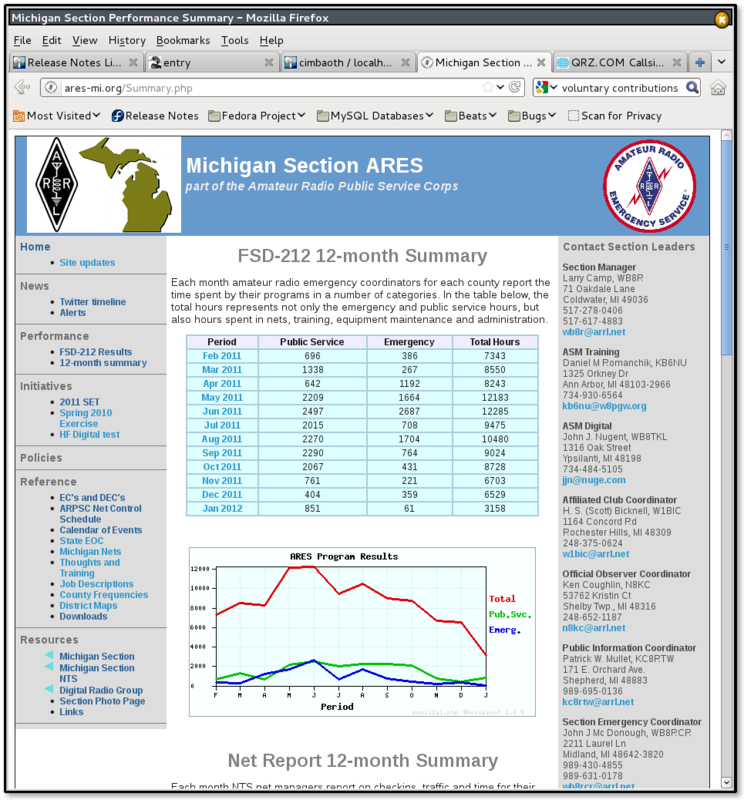 Detailed reports for the most recent month are available at http://nts-mi.org/netreport.php. Links on the page allow for viewing of previous reports or individual net history. Michigan amateurs also participate in other nets. The Eighth Region net takes messages destined for out of state addresses, and collects traffic bound for Michigan to pass to Michigan representatives who will then carry those messages to the Michigan nets. The Eastern Area Net interfaces with the Region nets to move traffic among the Regions in the Eastern Area. The Transcontinental Corps arranges to move traffic between the Areas. Michigan amateurs participate in all of these, however that effort is not reflected in Michigan reporting. The bulk of the traffic is passed through nine affiliated nets. Each net has an appointed net manager, responsible for arranging net controls and liaisons to other nets, and for reporting monthly to the Section Traffic Manager. To be eligible for affiliation, a net must report regularly and maintain liaison with other National Traffic System nets. In addition, there are perhaps 40 other nets operating within the state, approximately ten of which report regularly. In addition to reporting by Emergency Coordinators and Net Managers, individual amateurs are also encouraged to make reports. There are three reports from individuals; Public Service Honor Roll, Station Activity Report, and Brass Pounder's League. The Public Service Honor Roll reporting combines activity in a number of categories. Stations get "points" for net checkins, traffic, Section level appointments, public service oriented web or other digital systems, and hours spent in public or emergency service. If a station reports 70 points within a month, that station is listed in QST, the amateur radio journal. If a station is listed for 12 consecutive months, or for 18 months out of 24, the League will issue a certificate. 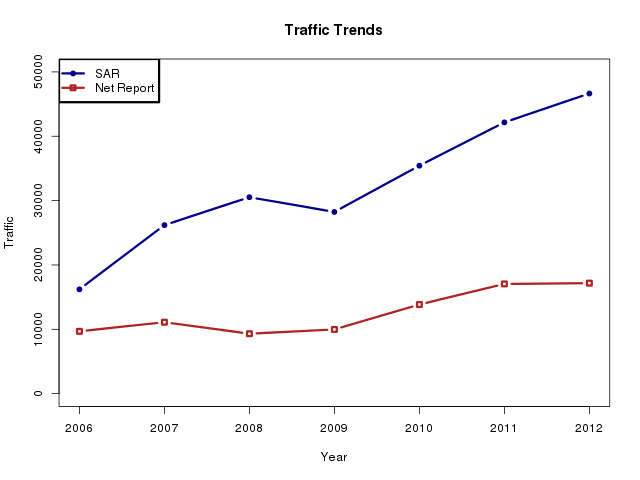 PSHR reporting for 2012 has been relatively flat across the year. The summer months tend to be higher due to bad weather and various public service events. Stations handling traffic are encouraged to submit Station Activity Reports (SAR) indicating the amount of traffic handled. 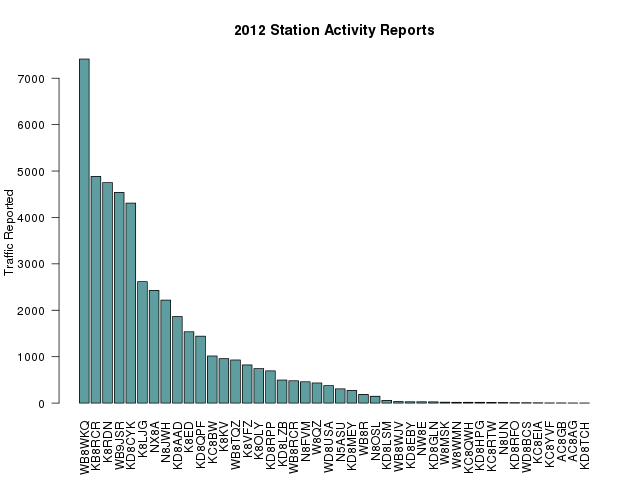 44 stations reported during 2012, up from 42 in 2011. Since most of the traffic is handled by relatively few stations, and those stations tend to be the stations that report, the traffic totals reported are quite high. Stations handling a lot of traffic tend to be those stations that act as liaisons to Region or Area nets, so even though the number of stations reporting is quite small, the amount of traffic reported is considerably larger than the totals from net reports, which include only messages passed on Michigan nets. For 2012, Michigan stations individually reported 46,641 messages. Stations reporting 500 messages passed in a single month, or a total of 100 originations plus deliveries are eligible for Brass Pounder's league. This requires substantial dedication, and only a few stations achieve this award. This is the first year for which records are available in which 7 Michigan stations earned Brass Pounder's League. In 2009 and 2010 only 4 stations earned this award. In 2012 the Section participated in three activations of the State Emergency Operations Center. None of these required the station be activated. In all cases the SEC participated via the CIMS and telephone conferences. In all cases the Section's participation was recorded in the Operations Chief's shift report. During the March 4 blizzard, a number of stations from across the District provided communications for Red Cross shelters and warming stations across the region. Travel across the area was difficult and only a small number of operators were able to activate. During the May 25 wildfires, operators from Luce county provided communications for a Red Cross shelter in Newberry. Cell phone service was challenged during the initial part of the event, although later in the response Verizon was able to provide additional cellular coverage. Mackinac county operators assisted the State Police by transporting MPSCS radios from the cache in St. Ignace to the fire scene. During the Lansing civil disturbance, the Operations Chief requested that we be prepared to activate the station quickly, but our assistance was not required. This event was primarily a law enforcement action. 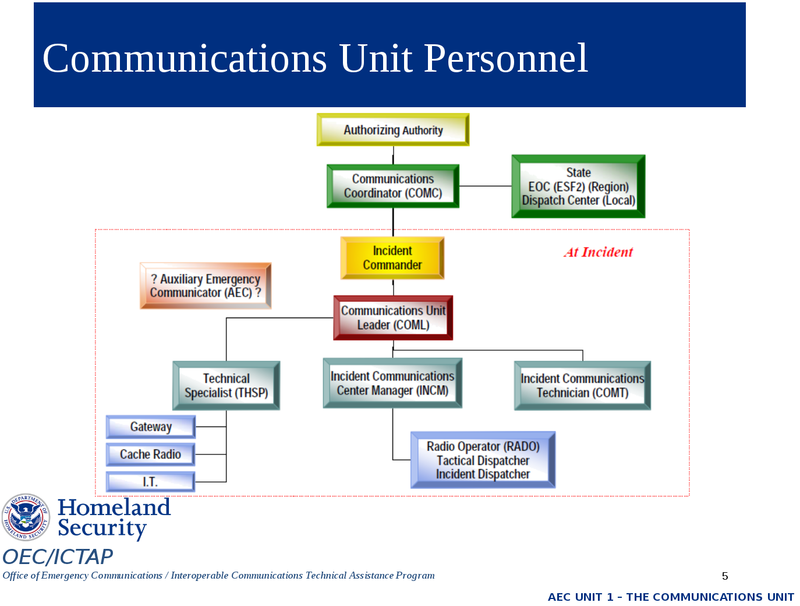 During 2012, the Michigan Section and the Michigan State Police began the formation of an Auxiliary Communications or ACS unit. The concept is to provide an umbrella structure to coordinate the efforts of a number of organizations that can offer communications support. A number of other states have formed ACS uints and it is currently being written into FEMA's Incident Command Structure. (FEMA refers to the function as AEC rather than the ACS used by the states.) FEMA already has several courses available to train operators in Auxcommm concepts. Unsurprisingly, Auxcomm reports to the Communications unit of the Service Branch of the Logistics Section. Auxcomm proved particularly helpful during the Palisades Ingestion Pathway exercise where it helped smooth the MARS/ARES interface. During that exercise ARES primarily provided the IC with additional situation awareness while MARS transmitted ground weather observations to the Warning Coordination Meteorologist present at the SEOC. In early 2013 a meeting is planned for Auxcomm representatives around the state to work out a regional structure for Auxcomm response. Local programs participate in numerous local and District-wide exercises on a regular basis. There are also a number of statewide exercises in which the Section participates. The State of Michigan performs a number of drills and exercises each year, most commonly concerned with nuclear power plants. During these drills and exercises, the State EOC station is activated, the SEC or his delegate participates in the EOC, and programs in the affected counties are activated. The Section also organizes statewide exercises each year. Section exercises, unlike State-sponsored exercises, tend to be functional, exercising primarily communications skills, and are developed to attempt to engage all the counties within the state. The Section has continued to work on the ARES/NTS interface and held two drills in 2012; one to further develop that skill and one to expand digital capabilities. Both exploited ICS forms. Emergency Coordinators have consistently asked for more statewide drills, with the most common request being for four per year. However, the FEMA HSEEP process proved to be quite burdensome, but also valuable. It seems unrealistic to expect the staff to prepare more than two exercises per year. Serve effectively as a partner to State Agencies as well as local agencies. Rationale: Although other Auxcomm entities have participated to a degree in State-sponsored exercises, focused functional drills have not been held to flesh out any challenges. The section utilizes a number of electronic media to communicate with members and potential members. The Section Emergency Coordinator maintains an email list of all Emergency Coordinators and District Emergency coordinators and uses this as a primary means of direct communications with the ECs. The Section Traffic Manager maintains a similar list of Net Managers. 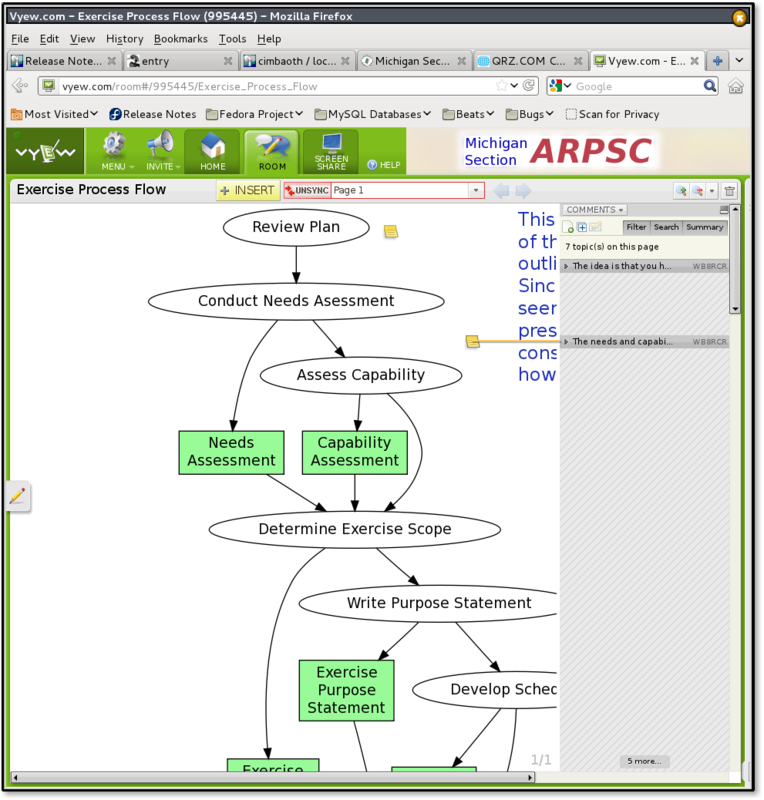 ARPSC maintains two web sites, one for ARES and one for NTS. There is also a Section web site for more general information, and a web site maintained by the Digiral Radio Group. Digital Radio Group http://www.mi-drg.org Reference information concerning various digital modes, especially packet. 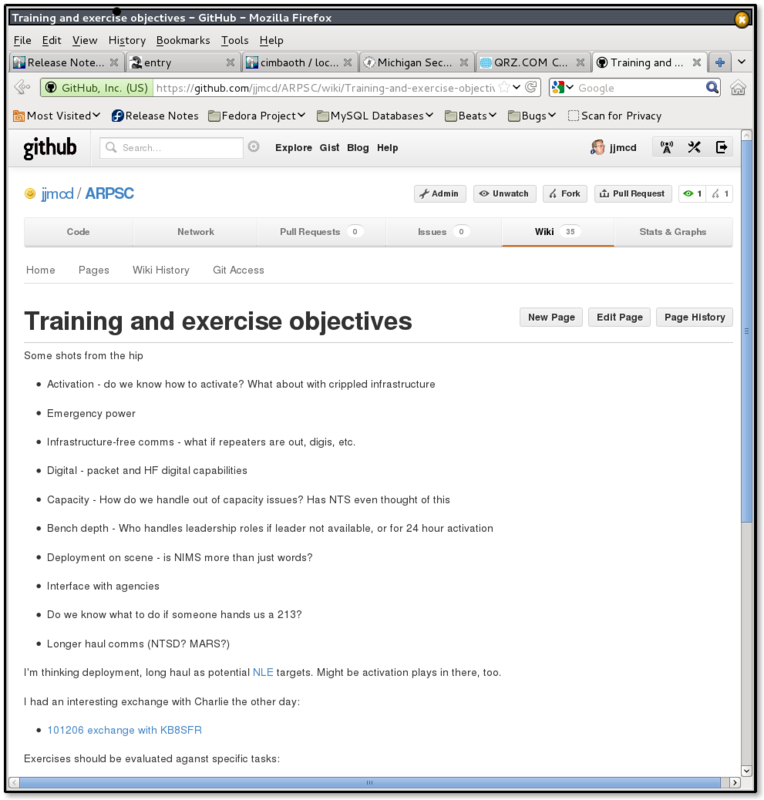 The screenshot below shows an example page from the ares-mi.org site. In addition to the Section sites, many Districts and Nets also maintain web sites. In early 2011, the web provider lost the mi-nts.org domain name which had been registered through the provider. mi-arpsc.org was a subdomain of mi-nts.org. The result was that both websites were down for some time. The SEC purchased the ares-mi.org and nts-mi.org domain names and moved these to a new server. mi-arpsc.org was redirected to ares-mi.org. The new web provider offers some features lacking in the earlier site, however, it is lacking a feature which had been used to provide RSS feeds for the web sites. The RSS feed has not yet been restored. The Section also maintains two Yahoo groups, the MIARPSC group is available to all Michigan amateurs, and is often useful for a number of discussions. The MIARPSC-DEC group is private to DECs and ADECs, and is used for discussions within a smaller group. As with websites, many Districts and nets have found it helpful to maintain their own groups, most of these also on Yahoo. The section maintains two microblogging accounts; miarpsc on identi.ca and mi_arpsc on twitter.com. "Tweets" or "dents" are sent to these sites periodically to remind followers of various upcoming events. Both sites get exactly the same feed. 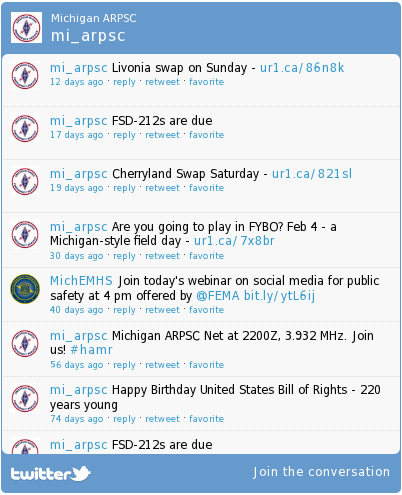 There is also a page on the mi-arpsc web site, http://www.ares-mi.org/arpsc_tweets.php where those who do not follow either microblogging site may view the feed. The section tries to keep the volume to a few tweets a week to prevent followers from feeling that the feed is too burdensome. Many of the tweets use the #hamr hash tag, causing those that follow amateur radio tweets to also see the messages. Meetings within smaller groups are often held remotely. Simple phone conferences are frequently used. In addition, Vyew allows documents to be shared online during these phone conferences. The section also maintains a wiki which is used by the ARPSC leadership to develop certain plans and strategies. A wiki allows all participants to contribute asynchronously to a "document", which in many cases can be helpful. The wiki is maintained on github which keeps a historical record and allows easy rollback of changes if necessary. It can be interesting to compare the current year to previous years, both to spot longer term trends as well as pick up causes of variations which may be used for improvements and remediation. 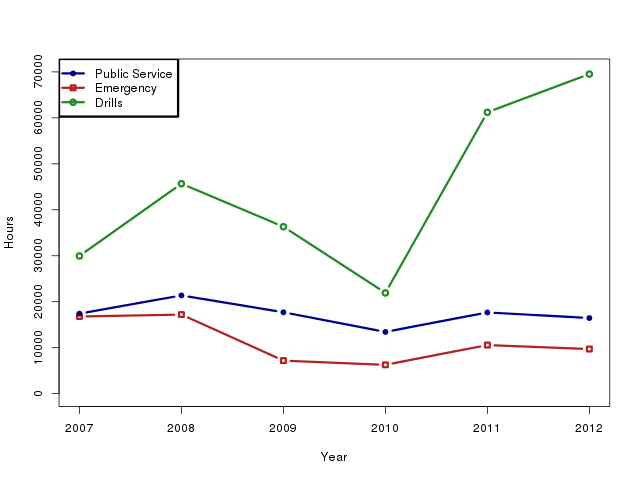 ARES hours across the emergency and public service categories are relatively flat. As might be expected, emergency hours tend to be higher in bad weather years. It is interesting that public service hours tend to track emergency hours; perhaps indicating that active years also lead to more reporting. Active years also tend to show an increase in drills. Not only do active years encourage interest, but bad weather damages amateur radio infrastructure as well, and programs tend to hold drills to test newly repaired or installed equipment. The spike in Drills for 2011 should not be a surprise. Both the New Madrid Aftermath exercise and the SET involved more effort and more amateurs than most previous drills. In 2012 there were quite a large number of drills as shown in Section 6, “Exercises”. In addition, there were quite a number of local drills and exercises, so 2012 hours continue to be high in spite of the lack of severe weather. 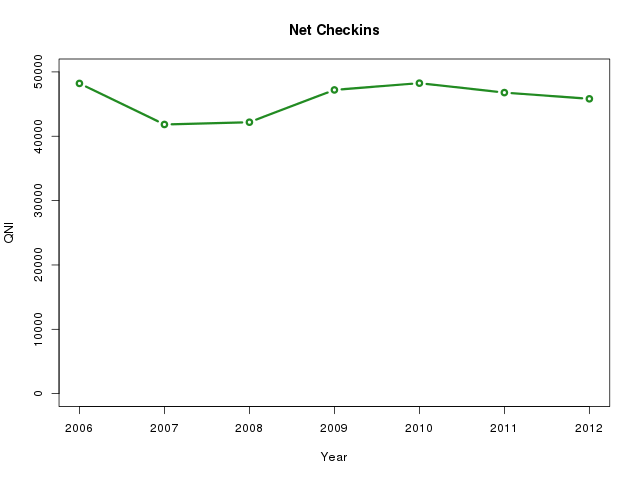 The number of checkins experienced by the nets in the section has remained relatively flat. It is not clear what caused the depression of 2007-2008. The drop for 2011 is probably somewhat permanent. The Wolverine Net had been an NTS affiliated traffic net. Over the years the traffic has dwindled, and last year that net asked to drop its affiliation with NTS, and along with it, their reporting. In addition, the Northern Lower Eastern Upper Peninsula net has been without leadership, and hence, without reporting. KB8RCR has been actively encouraging reporting, especially individual reporting. The number of amateurs reporting their station activity has increased significantly over the past few years. More and more Michigan amateurs are becoming involved in Region and Area nets, and even in the Transcontinental Corps. These tend to be very high traffic stations, and much of their traffic does not appear on Michigan nets. $2.583 million based on the Independent Sector value of $21.79 per volunteer hour for 2011. 2012 value was not yet available at the time of this writing.